So near and yet so very far! 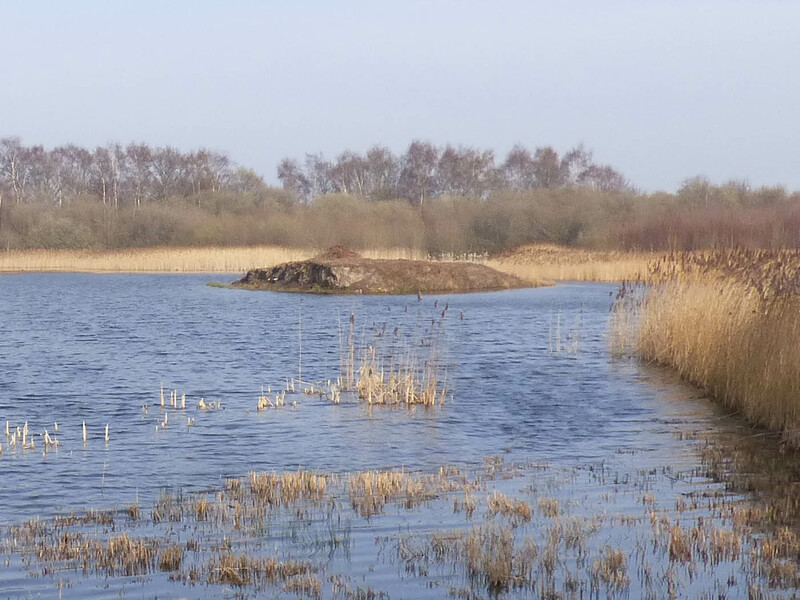 Yesterday we spent the afternoon at the Yorkshire Wildlife Trust property - Potteric Carr. As we venture into each of the many hides we always hope that this will be the time when we see something special. There is one bird that seems to evade us wherever we go. We have seen fleeting glimpses of it streaking by but one of our ambitions is to manage to take a photo. 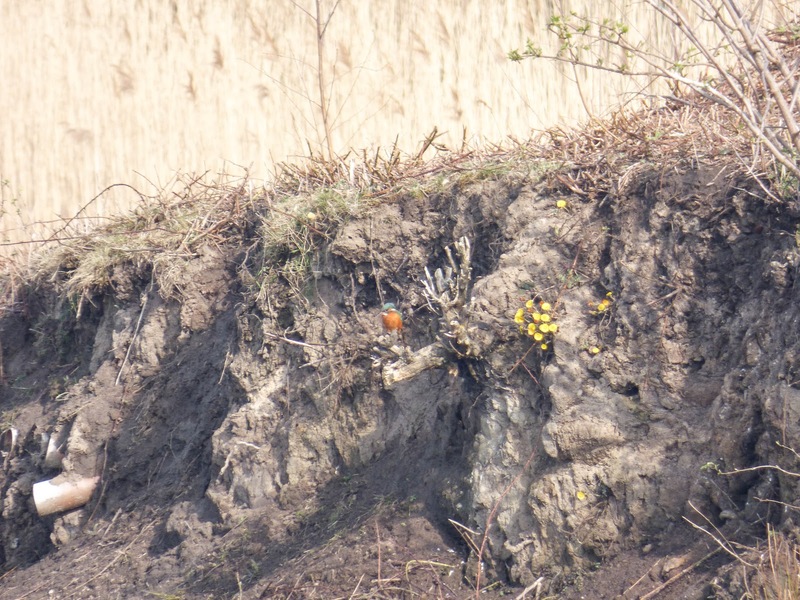 Entering one hide we were greeted by an excited occupant telling us that the bird in question was sitting on a banking by a yellow flower. The banking in question was in the middle of the lake. It's the mound in the far distance below. 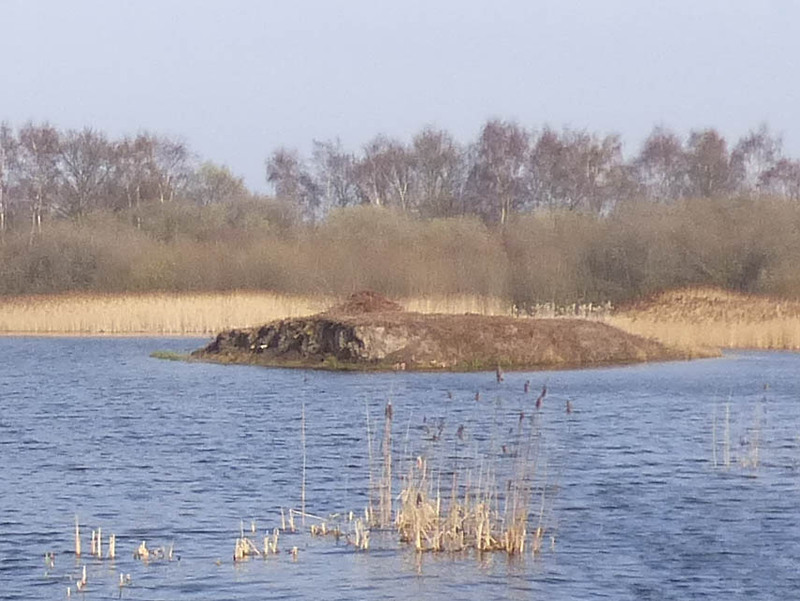 Below I've cropped the photo to help point out the banking. Can you see the bird yet? No? Let's try move in a little closer. How about that? You may be able to spot two white objects on the left of the mound. The bird is just above and to the right. To help he is sitting where the yellow spot is in the photo below. Time to zoom in a bit. Now can you spot him? 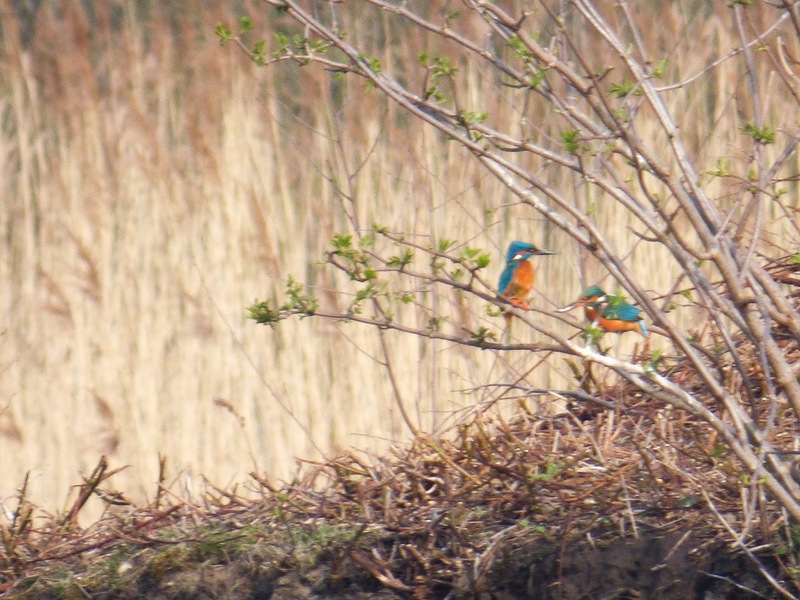 If it hadn't been for the binocular sporting occupants of the hide we would never have noticed the kingfisher. To be honest we are lazy bird watchers. We pop our heads out of hides and if nothing comes up and taps us on the shoulder we move on! 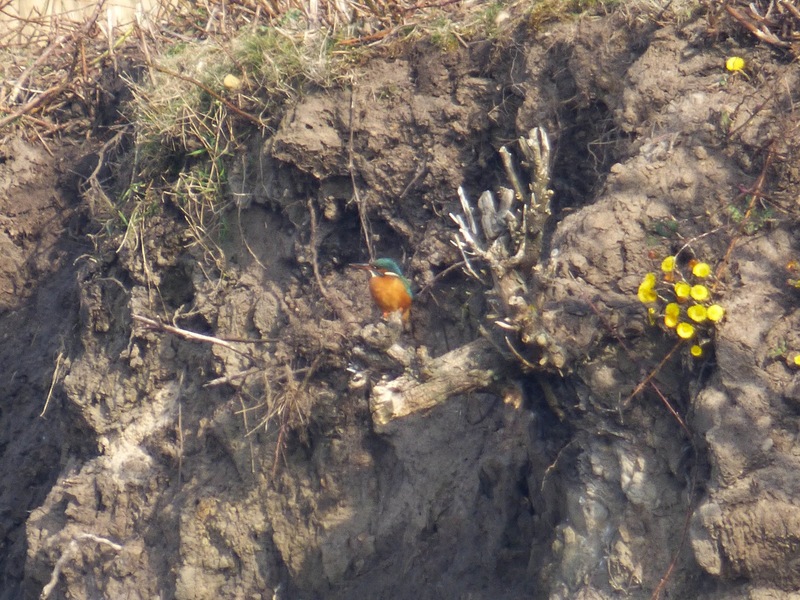 The object of our attention sat waiting patiently allowing us enough time to take lots and lots of photo. But waiting for what? 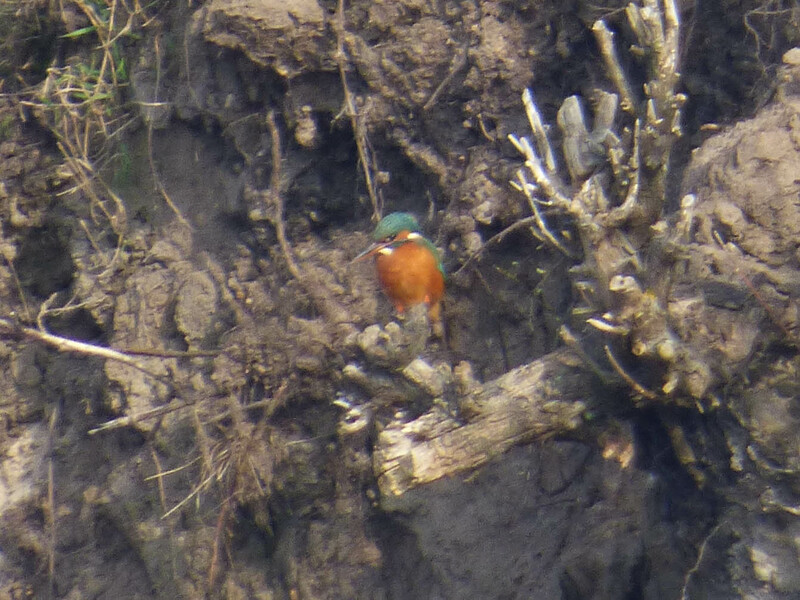 Then out from a crevice in the banking came kingfisher number two. 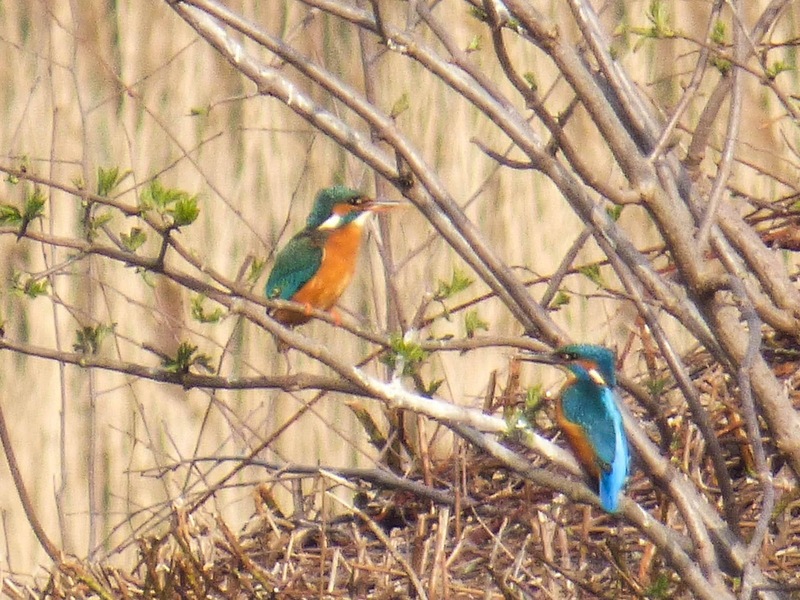 After some toing and froing the pair sat on a nearby bush. The red dot in the earlier photo shows the location. 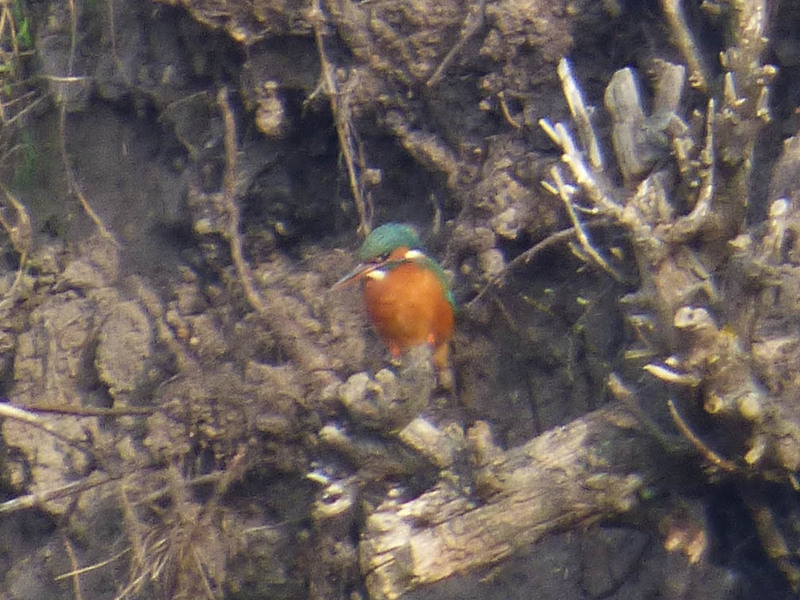 Through the zoomed camera lens, we could just make out the male offering his mate a fish. She didn't seem interested so he decided to eat it himself. 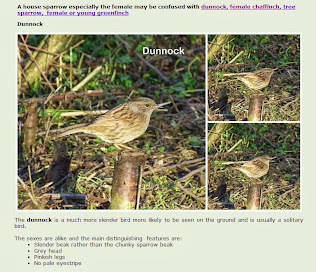 The photo below has been cropped from the previous photo. 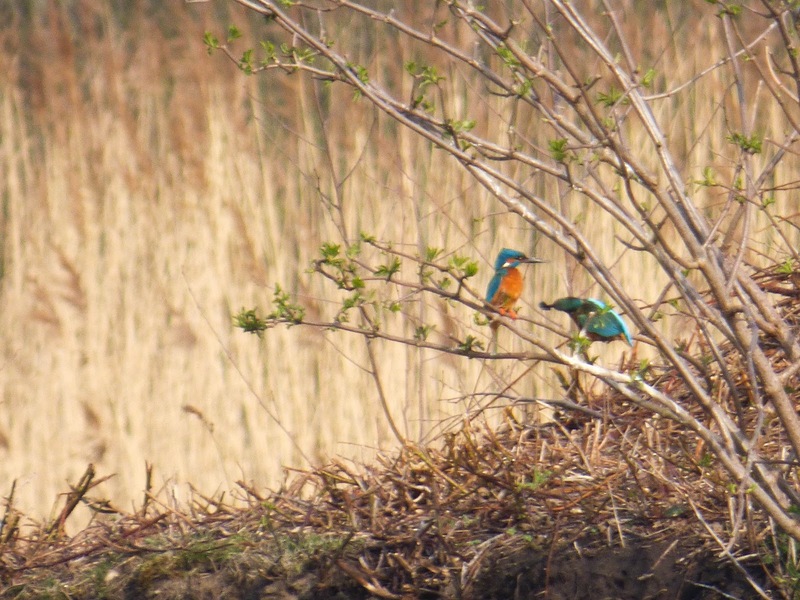 There was then a flurry of inevitable activity after which one of the birds flew back into the nesting hole leaving the other to sit and ponder for a while. 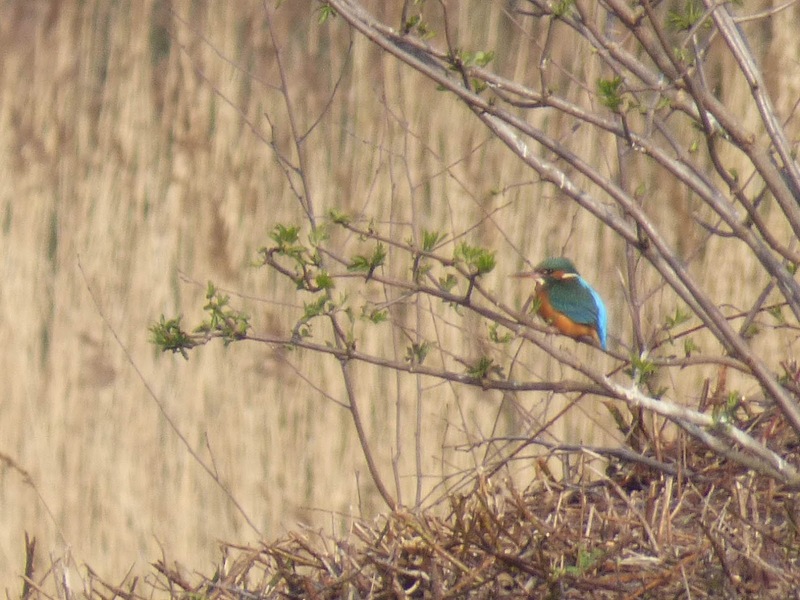 The quality of the photos isn't good but considering the distance we were just happy to have managed to get anything that vaguely resembled a kingfisher. 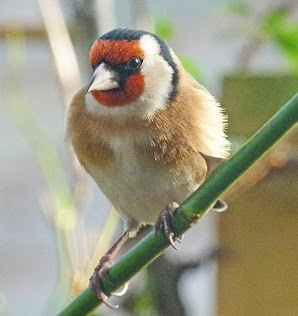 The bird sat still for ages - if only they had been closer we would have been able to get some fantastic shots, Still something to aspire to! On Monday whilst Martyn was investigating what had been happening under our weed control fabric - he wrote about this here - I cleared the long bed in which the remains of our dead raspberries were waiting for their fate to be decided. They had been left on the remote chance that they would recover. In the event one of the 36 canes had a shoot which was replanted. Once removed the dead canes were burned. 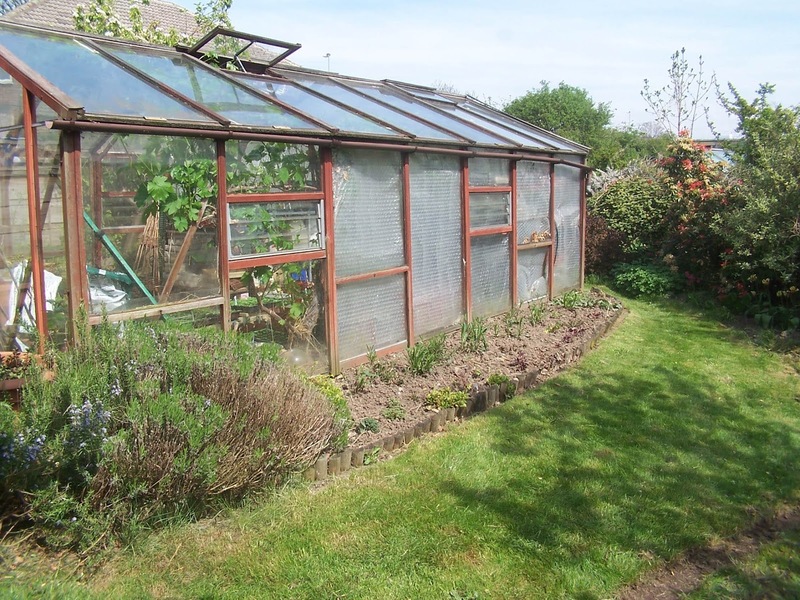 The plan is that the dahlia tubers that are at the moment being coaxed into growth in the greenhouse will be planted here. 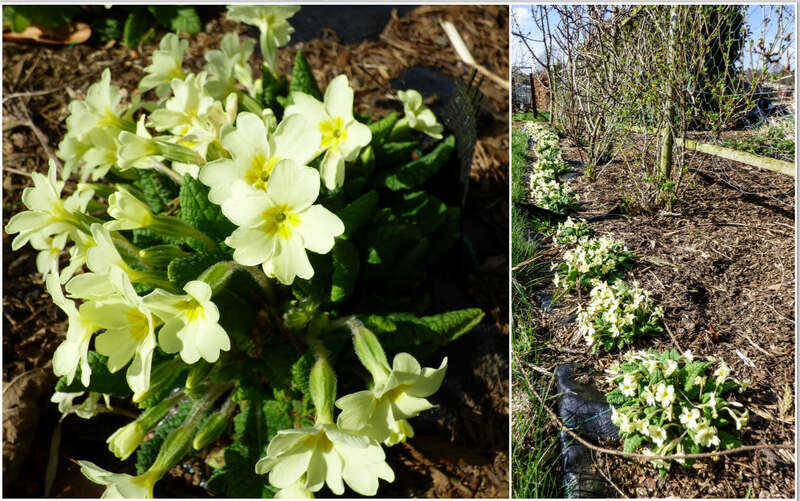 As the dahlias grow they should give the primroses a little shade from the hot summer sunshine! I always enjoy seeing the row of delicate creamy yellow flowers at this time of year. They always grow so much better than the ones I try to grow in the garden. 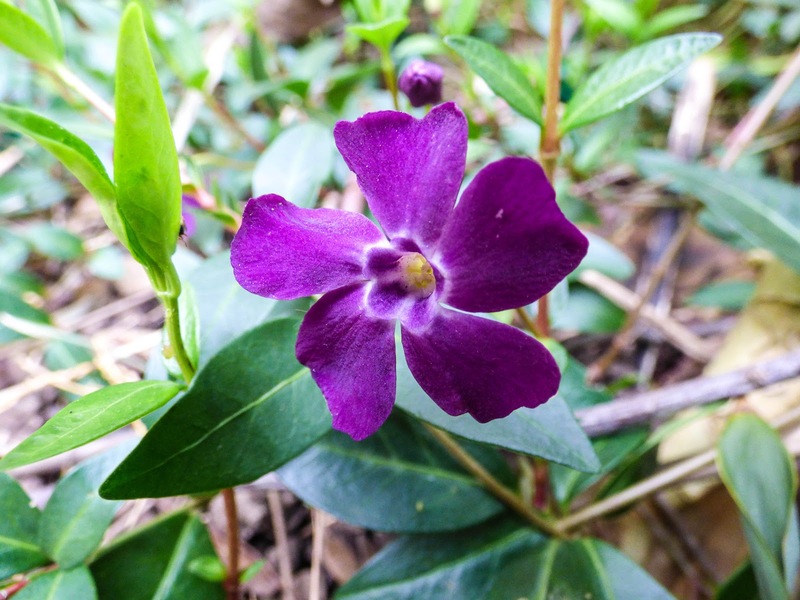 Another flowering plant that is happier in some parts than other are the wallflowers that I planted with sweet Williams, sweet rocket and dog daisies. One of the first things I noticed on arriving at the plot was that the some of the wallflowers were just starting into bloom. 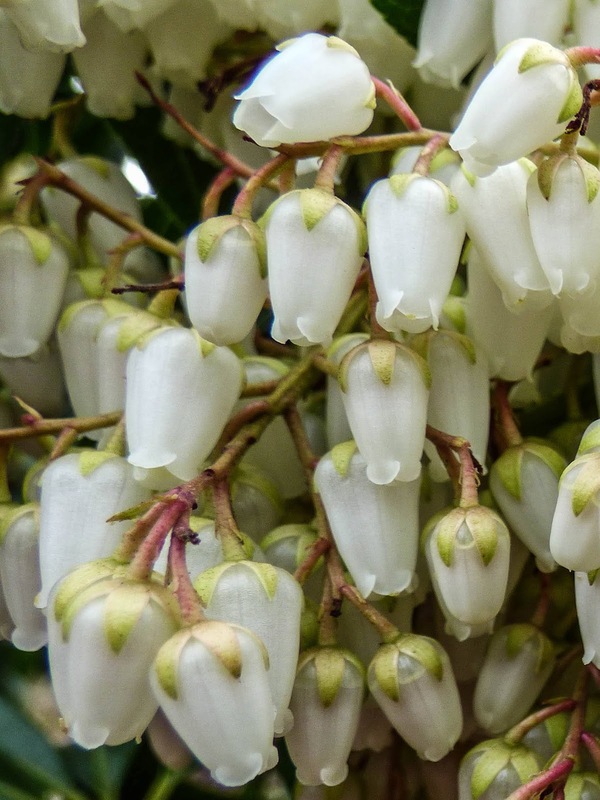 Others were smothered by buds. 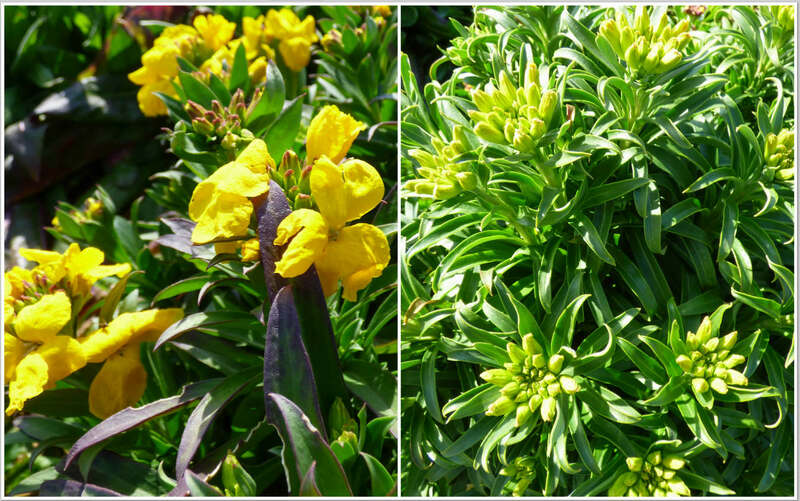 All the plants in the bed are growing strongly, however I squeezed one or two wallflowers into the bed alongside our plot patio. 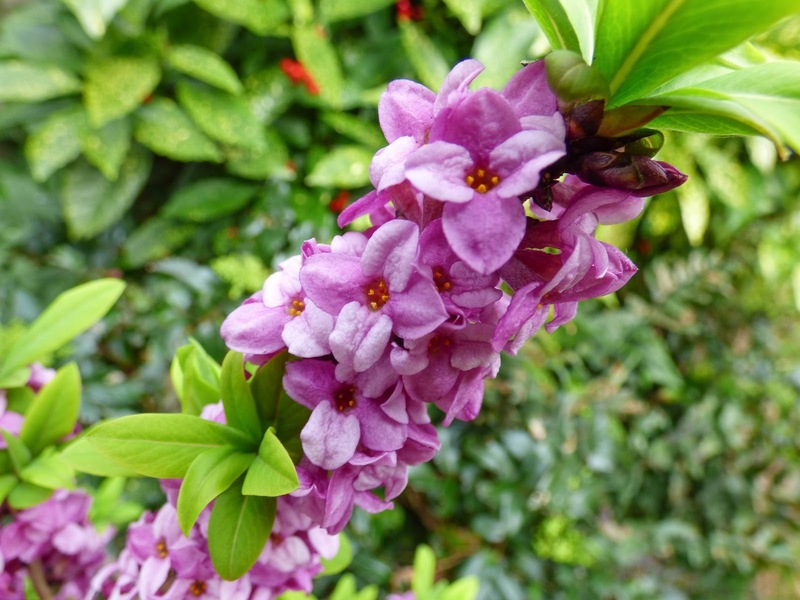 The intention was for us to enjoy the perfume when we were having a coffee break. I knew that this may be unsuccessful as the blueberries - being acid lovers - are fed with an feed containing iron sequestrene. 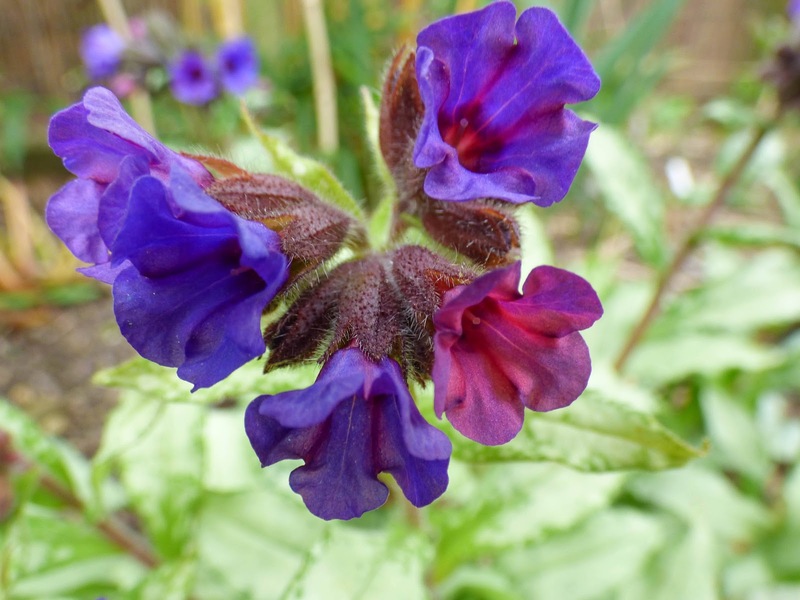 Wallflowers like an alkaline soil and consequently the plants growing here are very weedy specimens. Although in the garden we stick to the more diminutive daffodils, on the plot we grow their larger cousins some of which provide material for cutting. 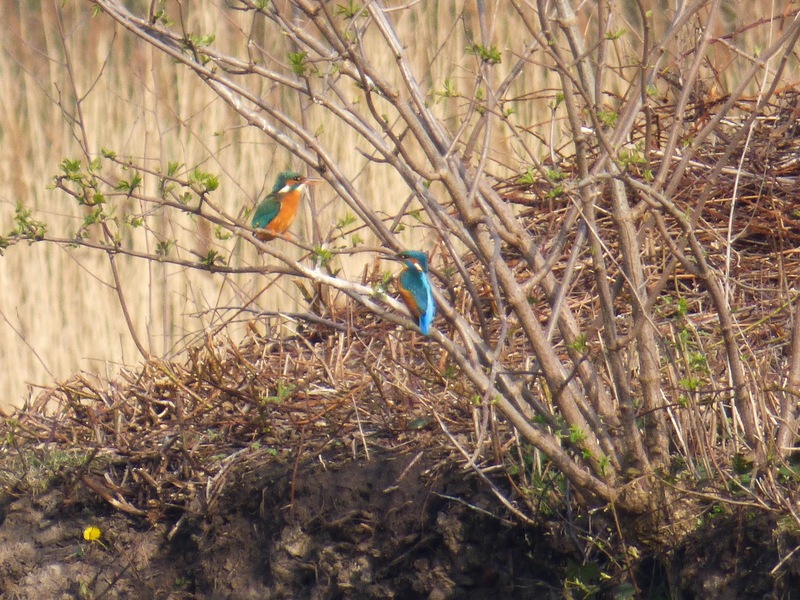 This year they look a bit sparser - maybe they need lifting and splitting. Not a job for the faint hearted as they are growing in rough grass. Also growing in rough grass under the plum trees is a lonely cowslip - maybe I should plant more. 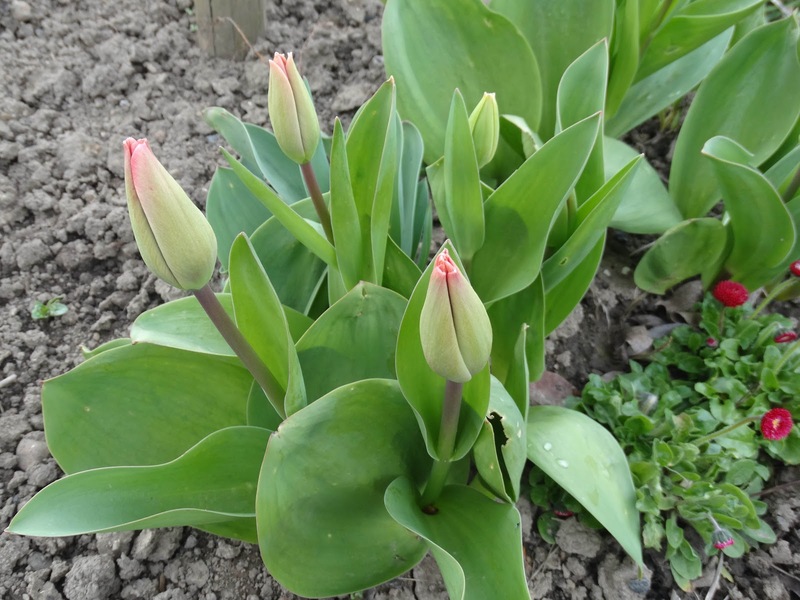 Tulips are a little more cosseted and grow beneath the pear trees. 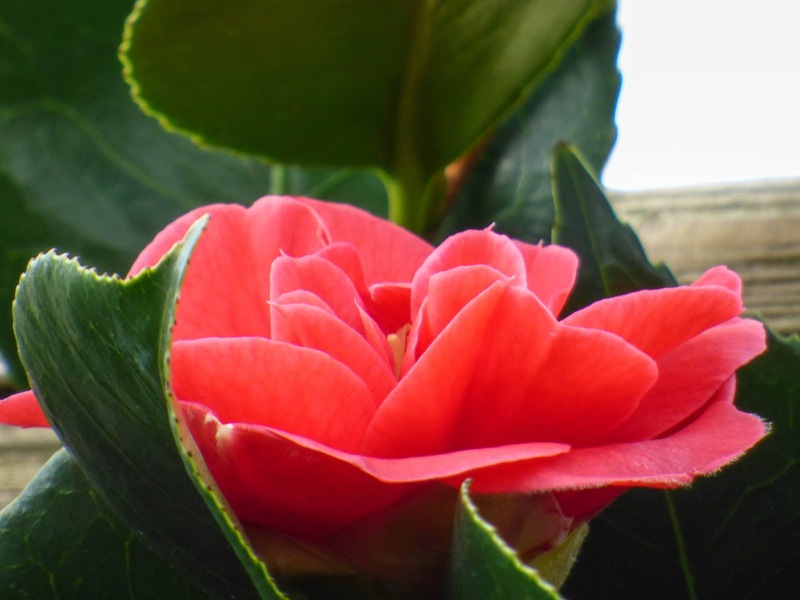 Their flower buds are just beginning to show colour. I know the experts tell me I should lift the tulips each year but I never have and they don't seem to mind. 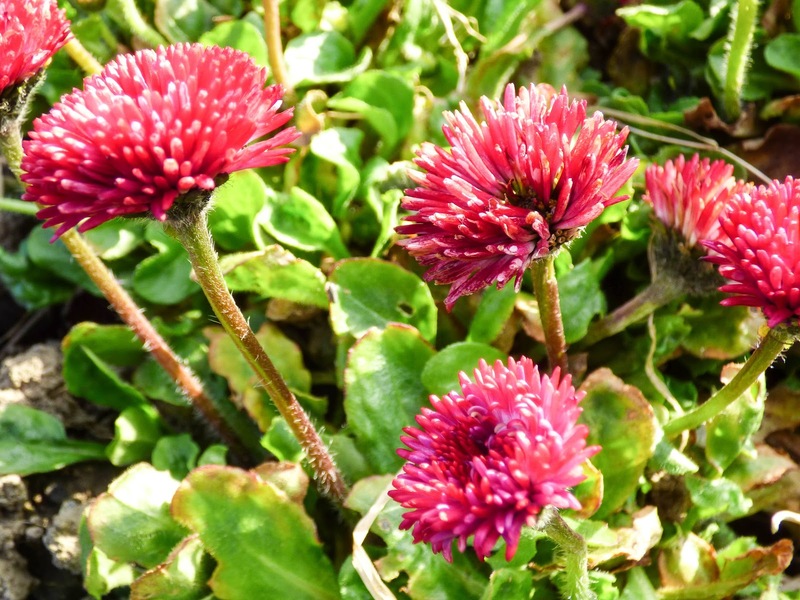 Bellis perennis 'Pomponette' that were grown from seed several years ago also keep coming back each year. Back to allotment tasks - my second job on Monday was to trim the lavender hedge. 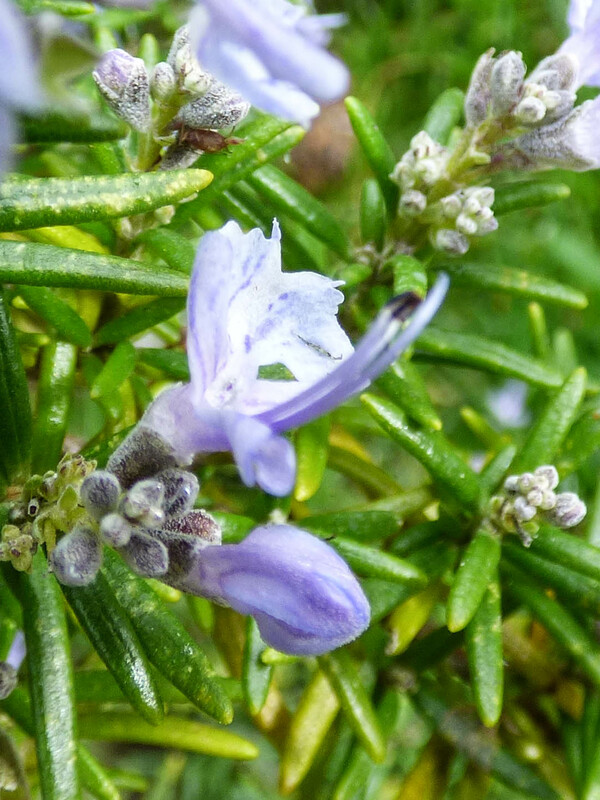 Left untrimmed lavender becomes straggly and bare at the base and so needs trimming to encourage shoots to form lower down the plant. I always do this when I see signs of new growth and that time had come. 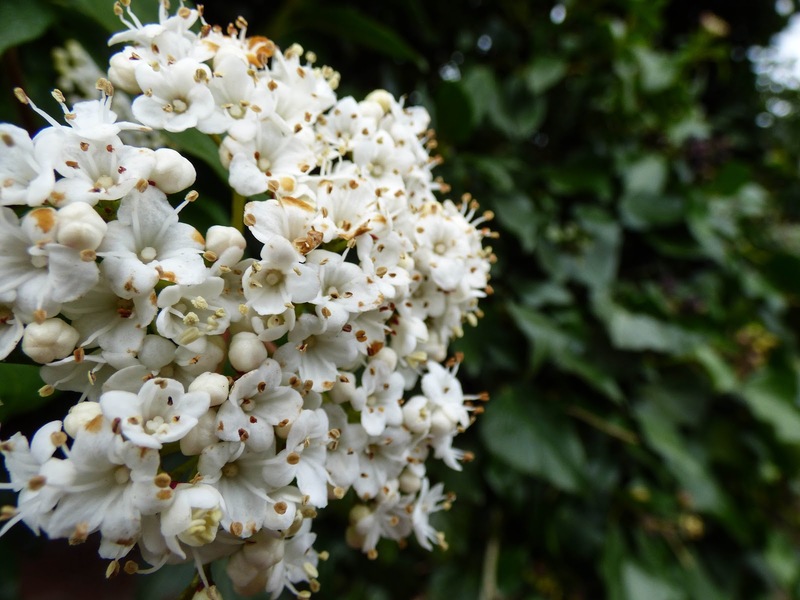 In the photo above you can see the straggly seed heads. A quick clip over with a pair of shears to neaten the shape and it was job done. So whilst Martyn went home smelling of smoke I went home smelling of lavender! 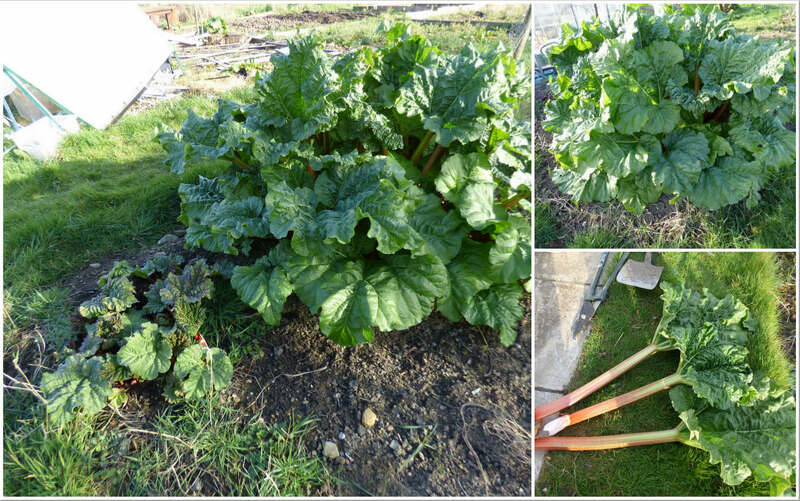 We're still holding back on actually planting anything on the plot just yet - we tend to err on the side of caution. As Martyn posted we are having our coldest temperatures of the year at the moment so don't feel the urge to hurry things. 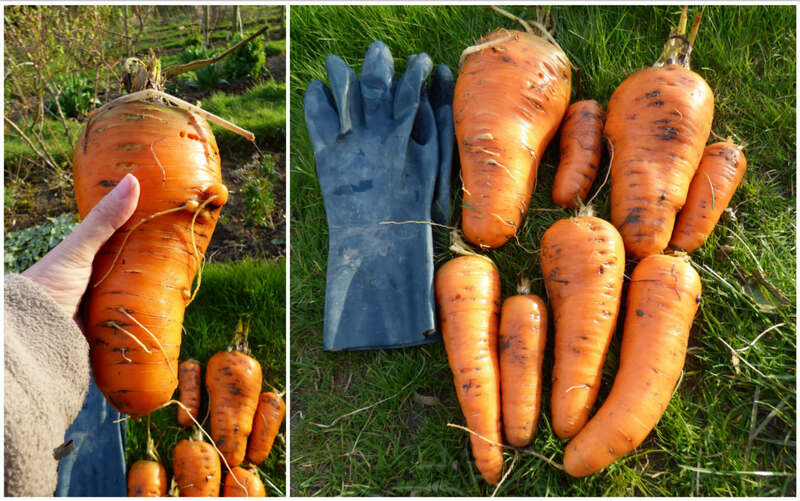 We still have crops to harvest including the carrots that just seem to get bigger and bigger. Some are not the prettiest of specimens, have split and have one or two holes but after cleaning them up there is still sometimes more than enough for two servings from one carrot. What's more they still have the carroty flavour lacking in commercially produced vegetables. In spite of the cold conditions things are moving along. 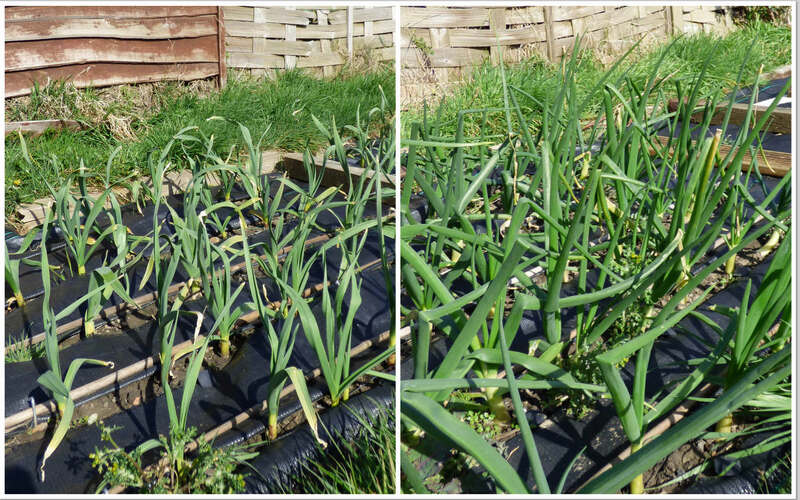 The onions and garlic planted last autumn are doing really well. To be honest I think they are the best they have ever been at this point in the year. Just a little bit of weeding along the rows is needed. The pear tree that was affected by what we think was fireblight last year and as a result is now a bush shape has lots of flower buds. 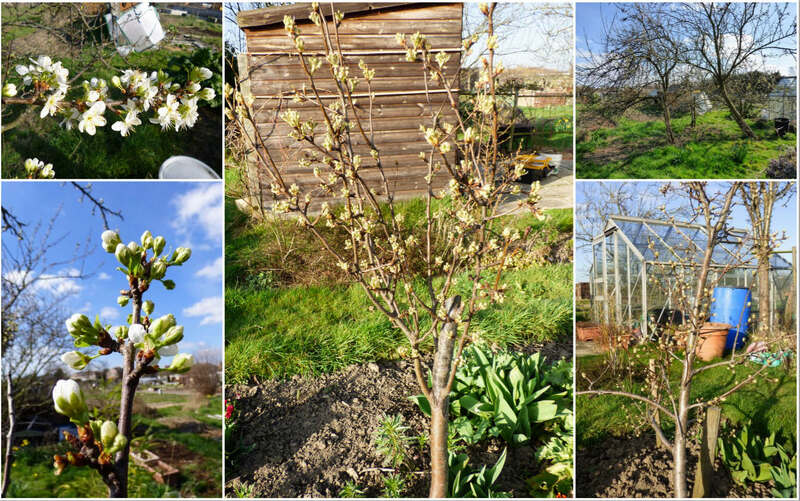 One of the other pear trees also has plenty of flower buds and the plums and greengages are also showing promise of lots of blossom. 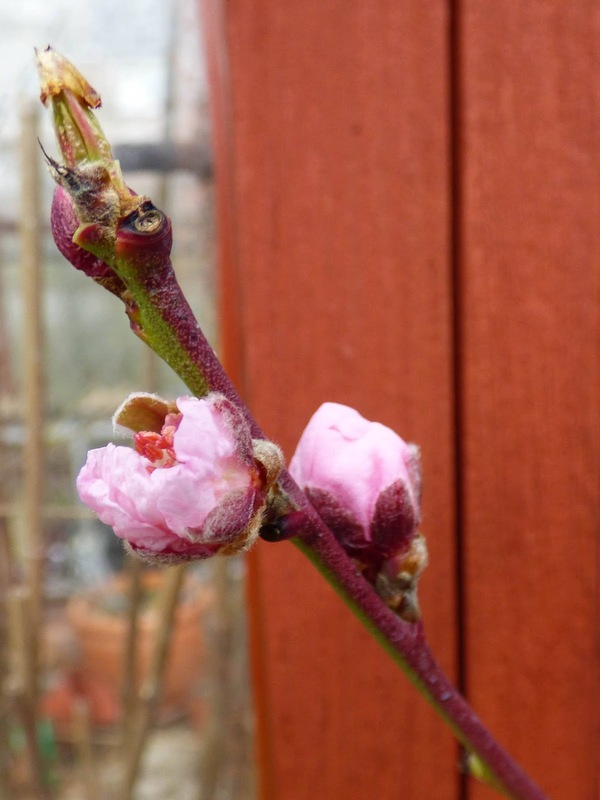 The plums and gages are due for a lean year fruitwise - they tend to crop well biennially - so the number of flower buds is a bit surprising although lots of flower buds doesn't necessarily mean lots of fruit. 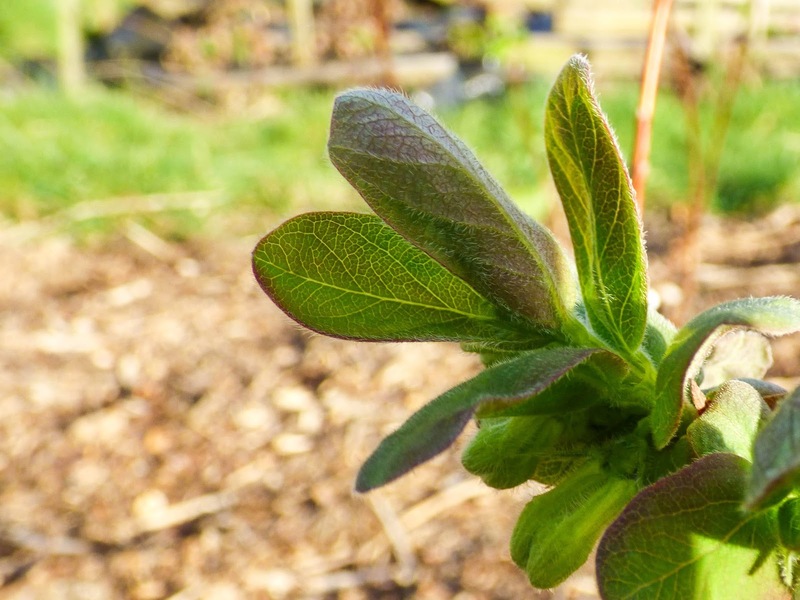 Other fruit plants are showing signs of life. Above is the bed containing jostaberries and gooseberries. Whereas the earlier varieties have stems ready for picking. The newly planted honey berries are certainly showing their family connection to honeysuckle. 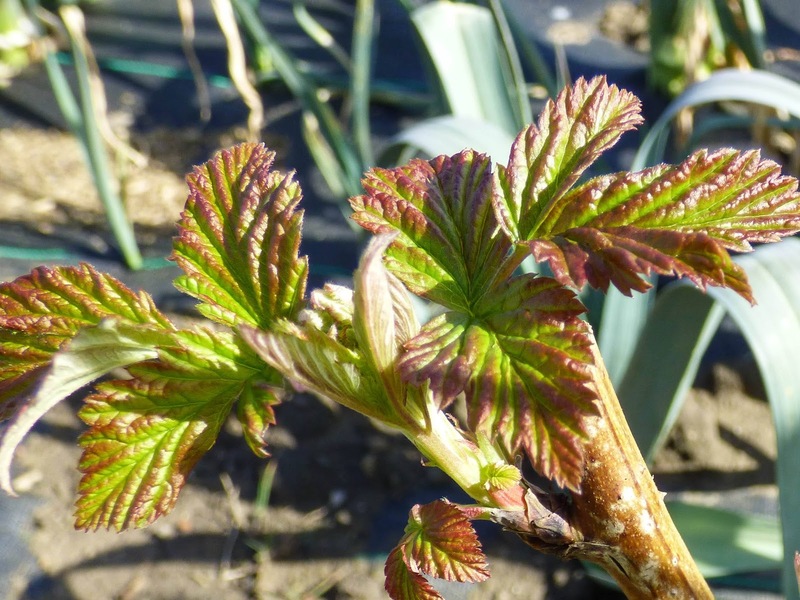 The new raspberry canes are also beginning to shoot. I just love the colours of the new raspberry leaves. It's always a relief when new plants show signs of life! The title doesn't refer to me although I guess some may say it could! 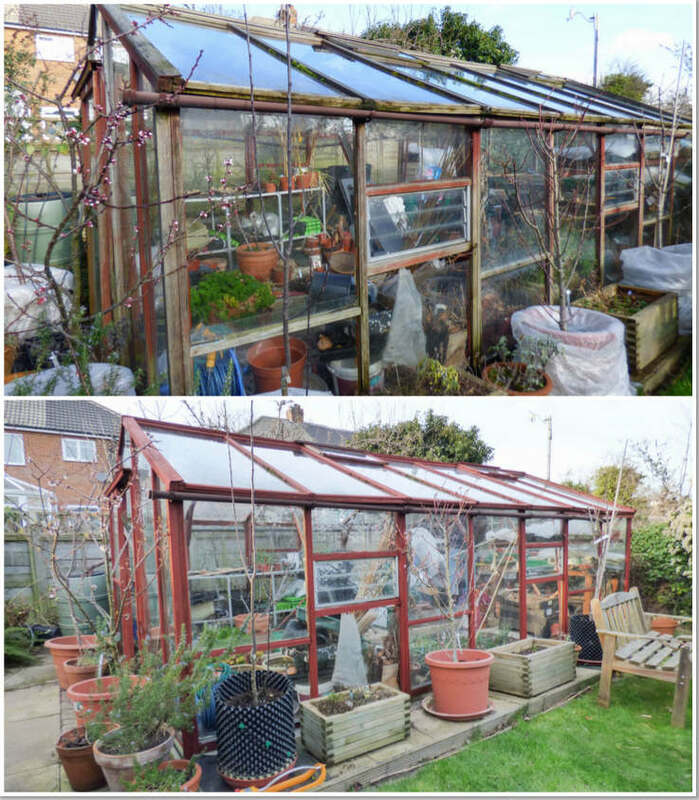 If you follow either Martyn's or my blog you will know that one of our major tasks of the year was to renovate our 25ish year old cedar greenhouse. (I posted about the history of the greenhouse here and the pre-renovation state of things here). Since announcing our intentions, we have been been busy. 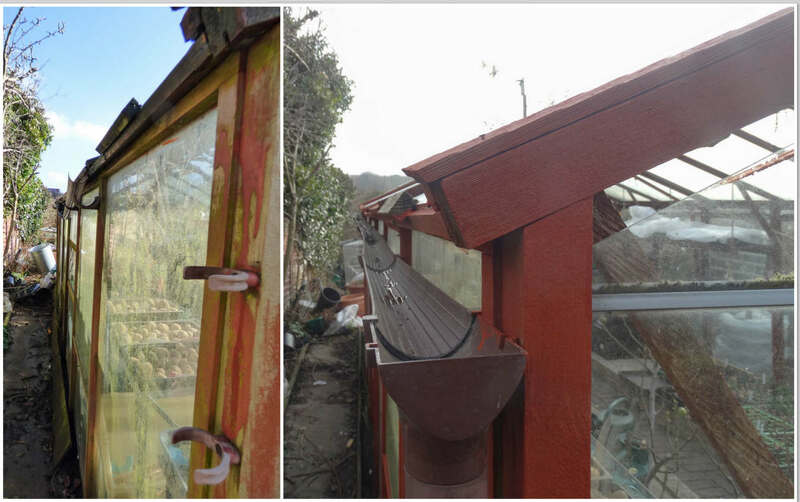 One of the first tasks was to restain the outside of the greenhouse. We chose a fine still day and both set to with brushes and red cedar wood stain. It took us a long afternoon to give the whole of the outside a coat. It also involved a bit of inventiveness on Martyn's part in order to reach all the roof struts. He screwed a paint brush onto a long piece of wood. 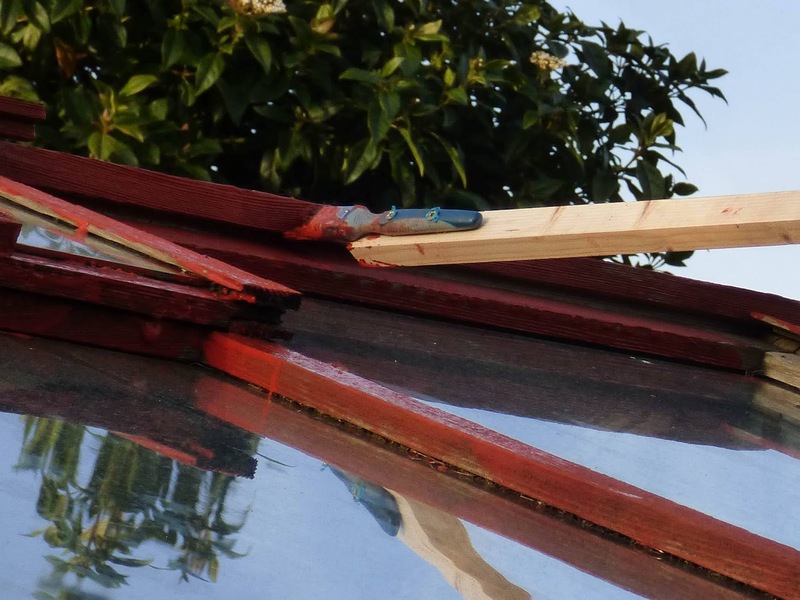 Manipulating the long paintbrush may not have produced the neatest job but it was definitely better than the alternatives which were either to leave the wood unstained or to remove all the glass sheets from the roof. Just a coat of stain and a few loose bits screwed down and things were already looking much better. Before and after shots below - don't dare say that you can't tell the difference! The other major task was repairing the roof. This task was held up as the sheets of polycarbonate that we ordered to replace the broken glass just didn't seem to want to arrive. A month after ordering it took a telephone assault on the company and the threat that we wanted our money back to get some action. Earlier Martyn had to fix temporary sheets of wood over the holes in the roof or the wind and rain would have caused havoc. 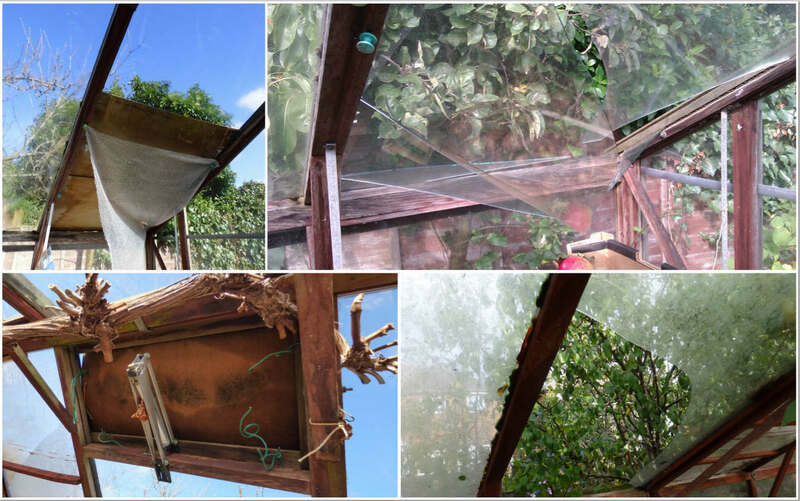 Unfortunately this temporary job wasn't a watertight solution and it rendered almost half of the greenhouse unuseable. 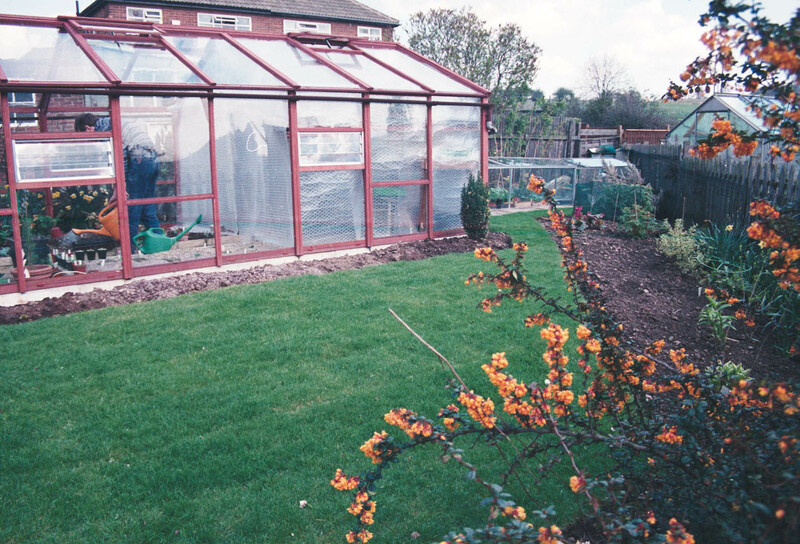 Eventually the polycarbonate arrived and we could fix the roof. This was anything but uneventful. Let's just say here that it involved a large splash, the two of us frozen on the spot staring at each other in disbelief and some vigorous scrubbing. If that has pricked your curiosity then you can read more on Martyn's blog here, Some areas of the inside of the greenhouse still need staining but that may have to wait until autumn/winter when the greenhouse is less full. 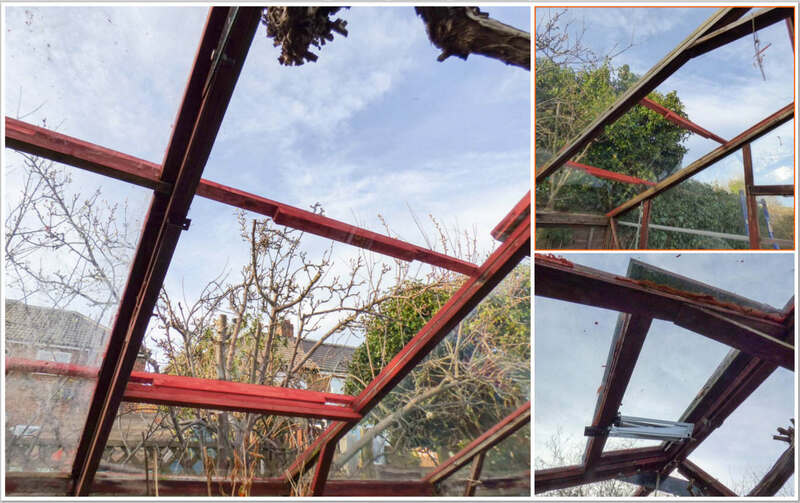 There are still one or two bits to deal with - for instance the difficult door needs some parts replacing and there needs to be some tweaking where glass has slipped and needs adjusting but at least now the whole of the greenhouse can be used and these 'small' jobs can be fitted in between the larger garden jobs on our list. 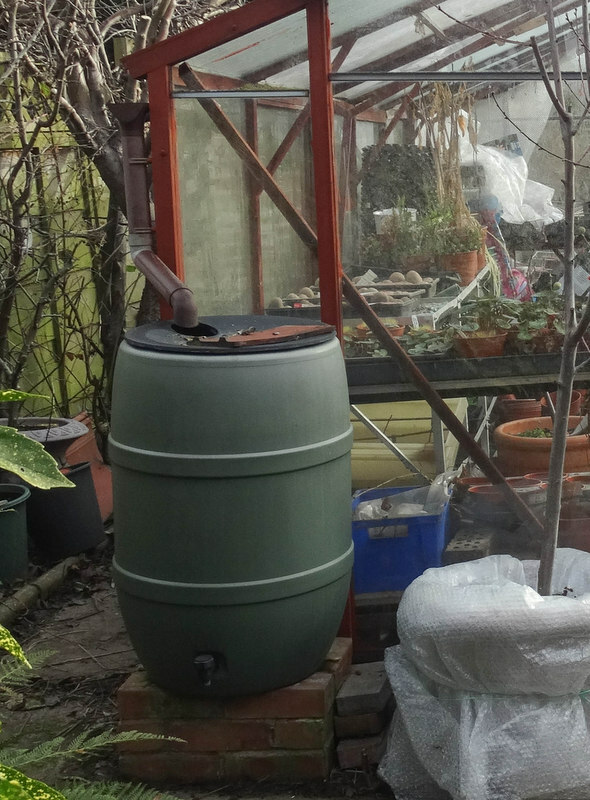 Now we need to either hide the existing water butts or to replace them with something more aesthetically pleasing. 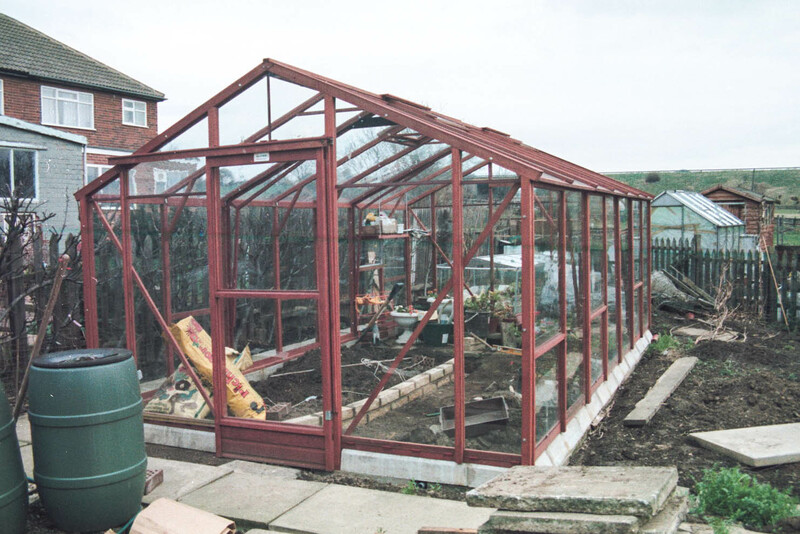 As regular readers to this and Martyn's blog will be aware, we are in the midst of greenhouse renovation. 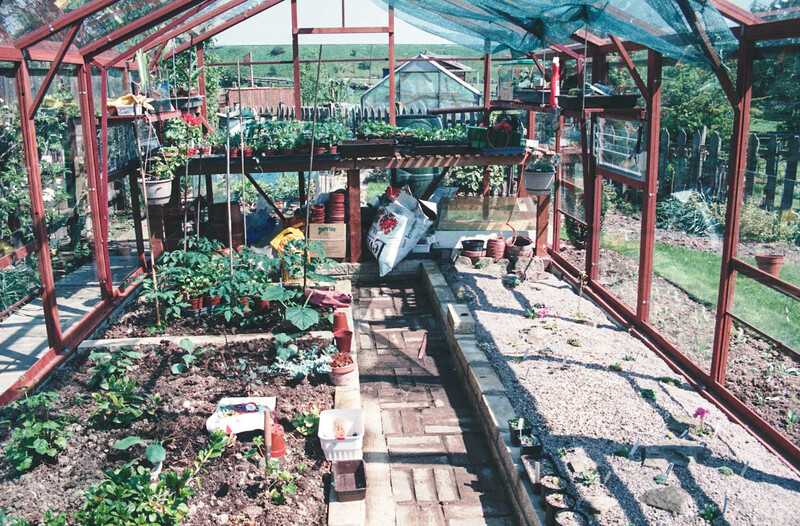 This prompted me to try and work out when we actually bought our present greenhouse. Using past photos, which as they were from a pre-digital era when we weren't as snap happy with the camera were limited, I have narrowed it down to the late 1980's probably somewhere at the end of 1988 and mid 1989. 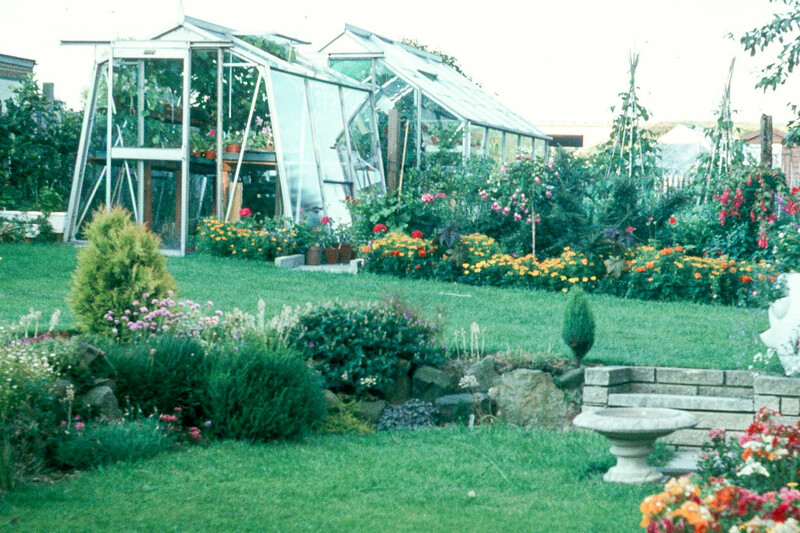 Our first greenhouse was a small aluminium greenhouse about 6' x 8' which we quickly grew out of. 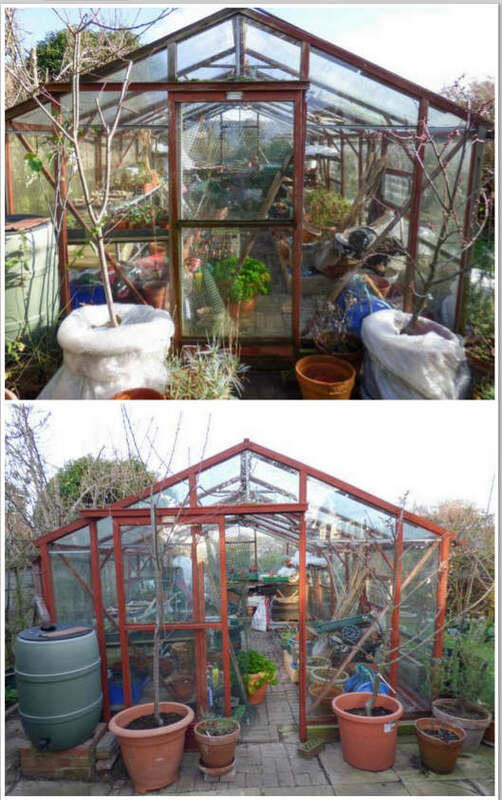 Rather than replacing it we added a 8' x 10' aluminium greenhouse. (Excuse the photos in this post - they are ancient). 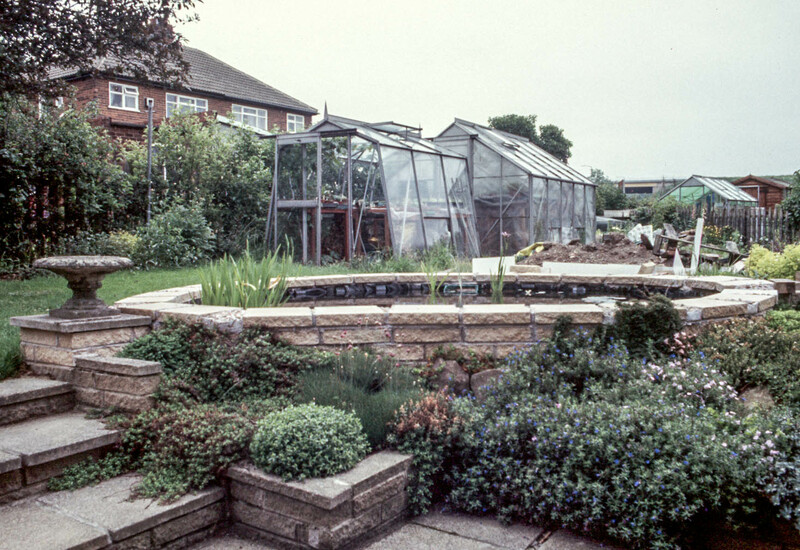 The photo above pre-dates our allotment era - you can just make out our vegetable patch alongside the greenhouse. We must have had our allotment by the time this next photo was taken as we appear to be restyling what was the vegetable patch. 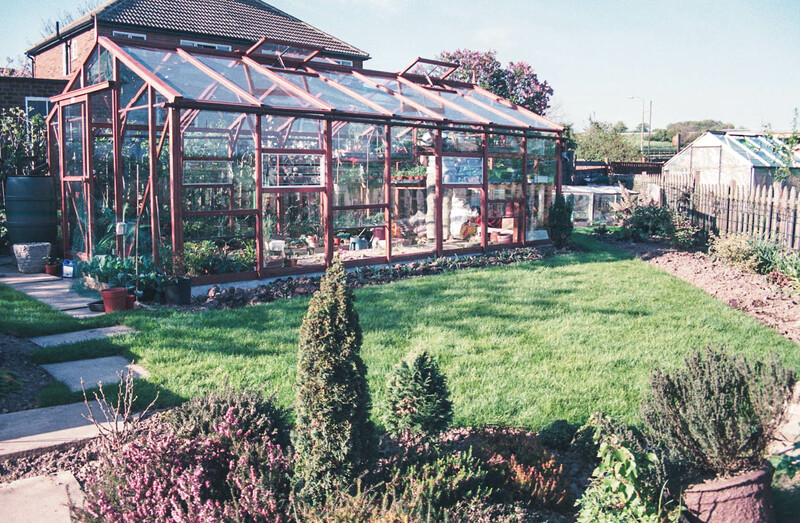 The smaller of the two greenhouses was heated so plants were taken from this to the larger greenhouse as part of the hardening off process. 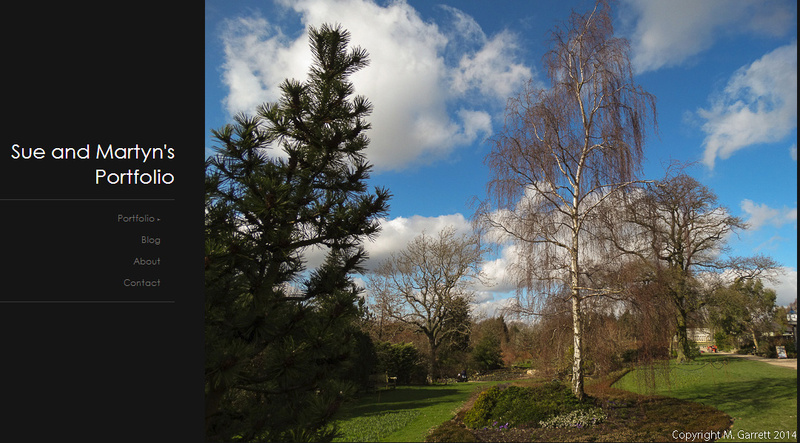 As the area alongside the greenhouse became more ornamental we decided to swap the two greenhouse for one larger cedar one. 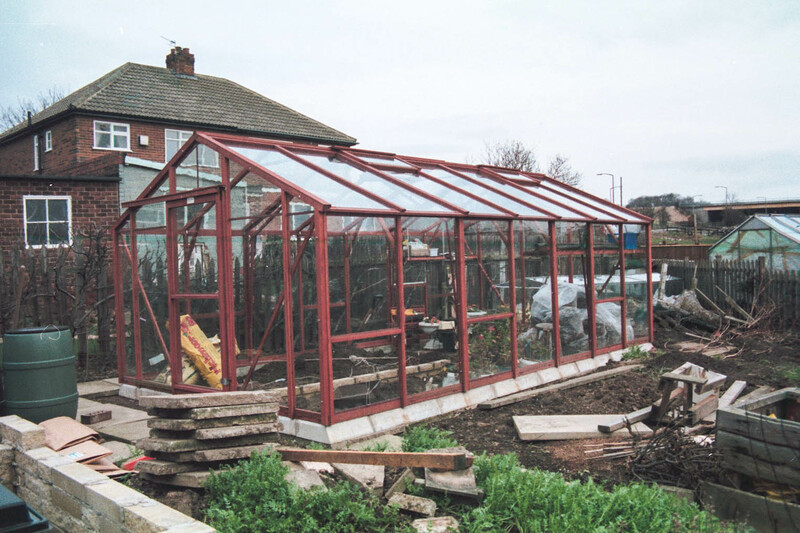 This greenhouse came in flat pack form as we decided we would build it ourselves which was quite a mammoth task having large sheets of glass to manipulate. 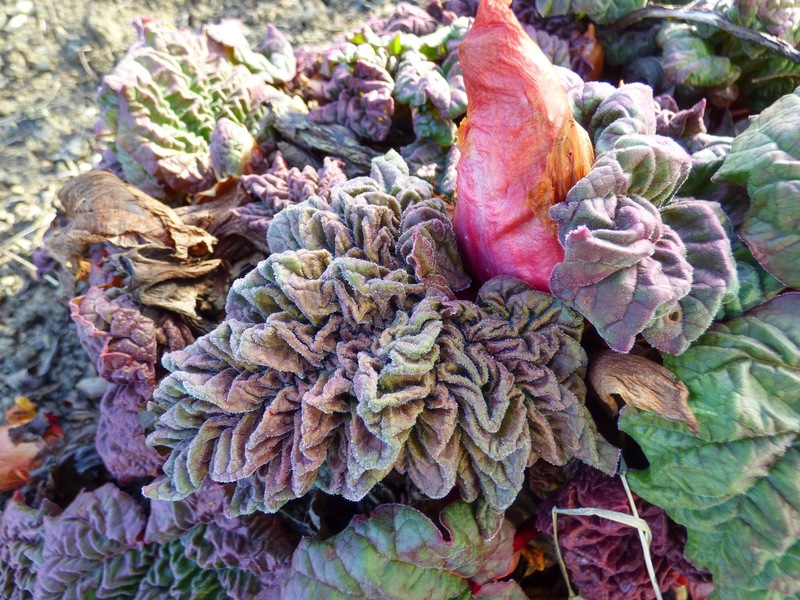 It created a major upheaval in the garden too. 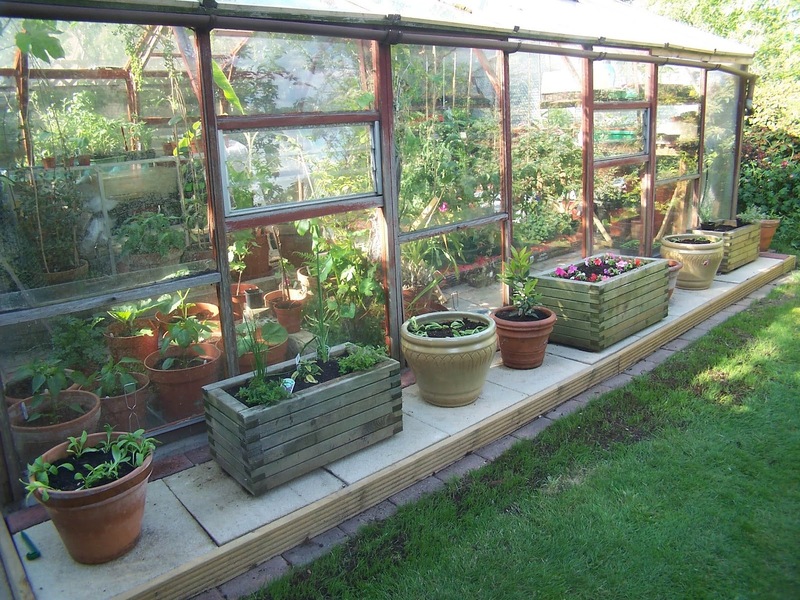 Beds were constructed inside the greenhouse. The ex vegetable patch was lawned and a new shrub border created alongside the boundary fence. At this point we planted directly into the soil on one side of the greenhouse and created an alpine scree on the other. Now it is being treated to a well deserved face-lift - more of that later.